The war that links the Revolution to the War of 1812 is really I suppose the Northwest Indian War or Little Turtle's War which doesn't really get the attention it deserves. 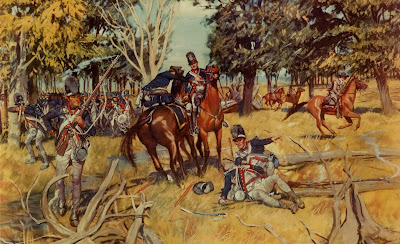 It saw the American army's worst defeat in St Clair's Defeat and the American comeback under Anthony Wayne. He created at Legionville the country's first boot camp mercilessly drilling his Legion of the United States into the perfect foil for Indian warfare, going onto victory at Fallen Timbers.